At the end of February DEFRA announced the formation of 12 new Nature Improvement Areas (NIAs) across the country. NIA is the new name for Nature Restoration Zones proposed by the Making Space for Nature Review. This aims to achieve a coherent and robust ecological network that would be capable of responding to the challenges of climate change and other pressures. One of the 21 NIAs is the Greater Thames Marshes NIA, and its area covers almost all of the estuary, on the north and south banks, including all the areas where a Thames estuary airport might be located. Each NIA will get money from government to create wildlife havens, restore habitats and encourage local people to get involved with nature. Maria Eagle yesterday went to visit the area. New nature zones covering hundreds of thousands of hectares are to be set up across England, Environment Secretary Caroline Spelman revealed today. The 12 Nature Improvement Areas (NIA) announced today will each get a share of £7.5 million to create wildlife havens, restore habitats and encourage local people to get involved with nature. From creating heathland on brownfield sites, a seven hectare lagoon and a network of wildlife-friendly dewponds to improving the conditions for birds, butterflies and amphibians, these 12 sites will provide the space for our wildlife to thrive. Local groups have worked together on proposals for how they intend to use the money to improve their local nature sites for the enjoyment of the public and the benefit of wildlife. The 12 successful NIAs have been chosen from among 76 groups who competed to receive funding for their project. “Each of these projects has something different to offer – from the urban areas of Birmingham and the Black Country to the rivers and woods of North Devon; from marshes, coalfields and wetlands to woodland and arable chalkland and grassland. The NIAs were awarded funding by a panel of experts, led by Professor Sir John Lawton, and were a key commitment of the Natural Environment White Paper. Greater Thames Marshes: includes agricultural marsh and urban habitats. It will create and enhance grazing marsh, salt marsh and mudflat habitats. Nature Improvement Areas (NIAs) are a new name for the “Ecological Restoration Zones” proposed by the Making Space for Nature Review. The UK recently signed up to challenging international targets to take effective action to halt biodiversity loss and restore ecosystem services and Nature Improvement Areas are fundamental to achieving the step change that is necessary for the creation of a coherent and resilient ecological network in England. There is also an increasing evidence base relating to the benefits and value for money of such investments in the natural environment and green infrastructure. In the Natural Environment White Paper, published on 7 June 2011, we undertook to support the creation of Nature Improvement Areas and to fund a Nature Improvement Areas competition to illustrate what works. The competition, launched in July 2011 to identify the 12 Nature Improvement Areas, generated 76 first round bids from a wide range of partnerships. 20 partnerships were invited to submit full business cases and a final 12 partnerships were selected to receive government funding. We envisage that these 12 Nature Improvement Areas will inform how the approach can be rolled out more widely. Defra and its agencies will provide £7.5 million over the current spending review period towards the cost of the 12 Nature Improvement Areas. We want to see Nature Improvement Areas wherever the opportunities or benefits are greatest, driven by the knowledge and vision of local partnerships. I love the coast – but I have to admit to being a land-lubber at heart. So heading off for the Thames this morning in full sunshine made me think that our planned boat trip would be running as planned. But the east coast has a mind of its own. Our voyage was to be an opportunity to take journalists out to see the area currently targeted as four-runway airport in plans by architect Lord Foster – the boat trip will go ahead, but not today. The Thames was whipped into waves by the unrelenting wind – and it was with some relief that we were able to view the estuary from the shore at Grain. 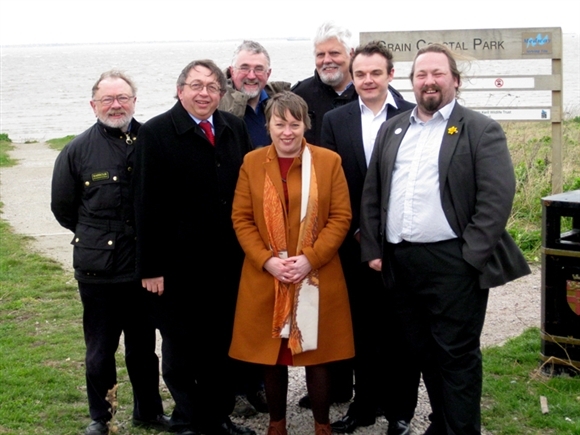 It was all happening on Kent’s Hoo peninsula today as Shadow Transport Secretary, Maria Eagle MP, was visiting the area to get a first-hand account of the issues. Braving the wind we managed to have a conversation about why the Thames is globally important for bird conservation, why this windy corner is a risk-filled environment for airport proposals (the Thames has been rejected repeatedly by study after study) why taking a massive bite out of the estuary’s capacity will give rise to potential impacts on the dynamics of the whole estuary and worsen flood risk, why we welcome the Government’s recent decision to declare the Thames Estuary a Nature Improvement Area. It was good to catch up with local campaigners and – Friends of North Kent Marshes was born at the height of the last (successful) No Airport at Cliffe campaign. The tide was in and gulls constantly rode the wind as they moved along the shore, a couple of hundred oystercatchers huddled in the lee of a bank – representatives of the hundreds of thousands of water birds that depend on the Thames for their survival. It’s up to us to tell their story – and to step up for this special place. Posted: Tuesday, March 6th, 2012. Filed in Biodiversity News, News about Airports, Recent News.